(CNN) - The US military labeled the actions of an Iranian vessel "unsafe and unprofessional" after it trained a laser on a US helicopter Tuesday. Three US Naval ships and a US Marine Corps CH-53E helicopter had an unsafe and unprofessional interaction with an Iranian Navy vessel while transiting the international waters of the Strait of Hormuz, according to a statement from the US military. The amphibious assault ship USS Bataan, guided-missile destroyer USS Cole and dry cargo ship USNS Washington Chambers were traveling through the strait when an Iranian vessel approached the US ships, coming within 800 yards of the Bataan, according to a statement issued Wednesday by Cdr. Bill Urban, a spokesman for the US Navy's Fifth Fleet. 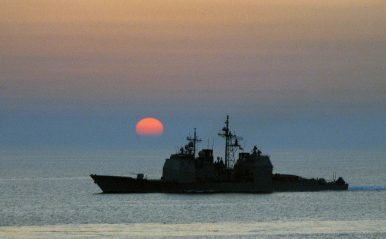 During the encounter the Iranian vessel trained a spotlight on the Cole and Bataan, scanning the ship from bow to stern. No warning shots were fired during the encounter. 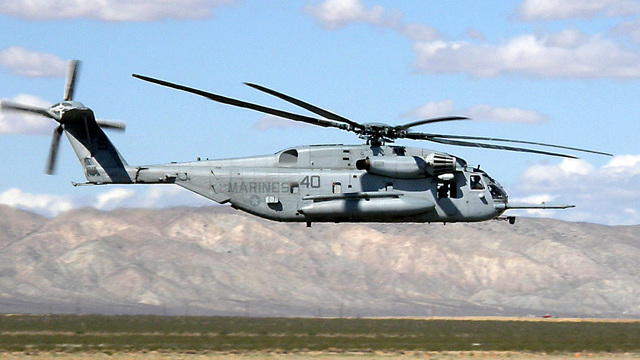 The Iranian sailors also shined a laser on the CH-53E helicopter that was accompanying the formation of US ships according to the statement. Urban said the use of a laser made the encounter unsafe and unprofessional. A separate US defense official told CNN that the Iranian vessel was a missile boat and that the use of the laser was detected by the helicopter which proceeded to fire off flares as part of its automatic defensive measures. "Illuminating helicopters with lasers at night is dangerous as it creates a navigational hazard that can impair vision and can be disorienting to pilots using night vision goggles," Urban said. It isn't the first time the US and Iranian navies have been involved in a tense standoff in the Persian Gulf. In April the US accused an Iranian Islamic Revolutionary Guard Corps ship of acting in an "unprofessional but also provocative" manner while approaching the American destroyer, the USS Mahan, while it was sailing in the Persian Gulf. Pentagon spokesman US Navy Capt. Jeff Davis previously told reporters that there had been 35 incidents of unsafe or unprofessional behavior by Iranian vessels in 2016, although the "vast majority" had occurred in the first half of that year. A second US official said that the number of unsafe and unprofessional encounters in 2017 was "way below" the number that had occurred by the same point in 2016.